Cubes can come in many sizes and have a wide variety of uses. 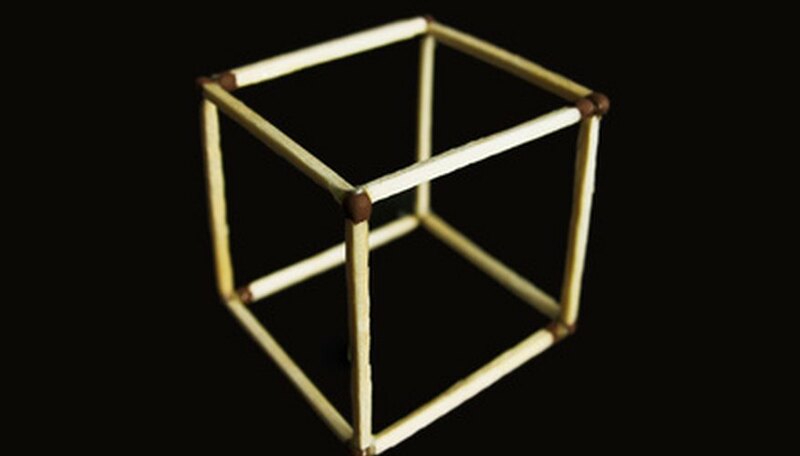 Many materials can also be used to form a cube. No matter what materials are used or size of cube desired, all cubes can be made the same way and share the same characteristics. Cubes are geometrically defined as a polyhedron containing six square surfaces of equal size. The cube will have eight points and 12 edges when assembled properly. Create a vertical strip of four equal-sized squares. Number the squares 1, 3, 5 and 6 from top to bottom, or farthest away to closest. Create a horizontal strip of three equal-sized squares by placing a square to the left of square 3 in addition to a square to the right of square 3. These will be numbered 2 and 4 respectively. The resulting pattern should resemble a cross. Create the cube by folding up squares 1, 2, 4, and 5 using square 3 as the base. Place square 6 on the open edges of squares 1, 2, 4, and 5 to form the top of the cube. Seal the exposed 12 edges of the cube with tape, caulk, glue or other appropriate adhesive compatible with the material used.